Black Irish…Who Were They and What Does it Mean? If you are like most people, you have heard the expression “Black Irish” more than once. If not, then instead of being curious you get to be one of the lucky ones and say “I know what that means”. Why? Because you were smart enough to read this article. The term “Black Irish” has been around for centuries, although it is almost never used in the country of Ireland itself. There are many stories as to the how the term originated and most are plausible for good reason – none can really be proved or disproved. What can be asserted with reasonable certainty is that “Black Irish” is as much of an aphorism as it is an axiom. In other words, the label was originally used to describe the general appearance of those Irish with dark hair, dark eyes or a dark complexion. And these features seem to have begun with the Norman invasions of 1170, led by Strongbow. The Normans originated in France and the Franks were known to have black hair. However, the Vikings were known by the Irish as as “dark invaders” or “black foreigners” and they first raided the Green Isle around 800 A.D. They continued to be a scourge upon Ireland until their ultimate defeat by Brian Boru at the Battle of Clontarf in 1014. Viking survivors integrated into Irish culture and created a clans of their own that were known as “septs”. Interestingly, the Gaelic word for foreigner is “gall” and for black (or dark) is “dubh.” Interestingly, the name Doyle is translated in Irish as “O’Dubhghaill” or, “black foreigner” and Gallagher is “O Gallchobhair”, which means “foreign help”. Another possibility for “Black Irish” origin is the descendants of Spanish traders who settled in Ireland and perhaps even subsequent generations of the few Spanish sailors who were washed up on the west coast of Ireland after the disaster of the Spanish Armada of 1588. As mentioned previously, it is most likely a descriptive term rather than a term to describe the descendants of a specific group of people. A good example of this are thousands upon thousands of Irish who immigrated to America during and after the Great Famine of 1845 to 1849. 1847 was so bad it was known as “black 47”. Also known as the “Potato Famine”, the rot of the potatoes of Ireland destroyed the main source of food for an entire population. Potatoes were turned black and the survivors were known as those who fled the “black death”. While it was most certainly used originally in a derogatory fashion, the term “Black Irish” is now considered a badge of honor, especially for those who can trace their origins to the immigrants of the year “black 47”. The truth may never be known for sure, but we can be relatively certain that it did not originate as a designation for an actual class of people, but moreso as a term to describe physical characteristics and perhaps as a nickname for the survivors of a great famine. http://ltcornerpub.com/wp-content/uploads/2017/02/Irish-Roots-Black-Irish.jpg 264 782 Bill Greer http://pvatestsite.com/LTPub/wp-content/uploads/2017/01/ltpub-logo-300x180.png Bill Greer2017-02-23 20:13:572017-02-23 20:13:57Black Irish...Who Were They and What Does it Mean? 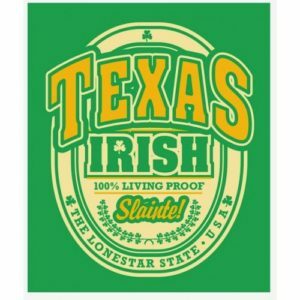 Texas Is An Irish State, Too! The Irish have been a bigger part of Texas than most people realize and Irish immigration to the Lone Star State began in earnest during the 1840’s. But the Potato Famine was only one of the reasons the people of The Green Isle eyed Texas as their best bet for the future, with the earliest colonies being established along the coast of Texas with settlements in North and Central Texas beginning soon after. Texas was well known for its abundance of natural resources compared to a low population. As early as 1828, the first colonies of Irishmen sprouted in the coastal areas and were very inclusive with a diverse population including many Mexicans and settlers of other nationalities. In 1850 the Texas census report included 1,403 Irish with that number growing to 3,480 in 1860. Many soldiers who had immigrated from Ireland were early participants in some of the landmark engagements that have made Texas famous and many more were a part of the war of independence against Mexico. There were as many as 29 men from the United Kingdom who gave their lives at the Alamo and many were Sons of Erin. And at the Battle of San Jacinto, roughly 100 Irish soldiers comprised over 15% of the entire Texas fighting force. But long before all of the mass immigration, a descendant of the first King of Ireland escaped political and religious persecution, fleeing from Ireland to Spain. He settled in Aragon and served in the Spanish Royal Army as a volunteer, eventually attaining the rank of Major. He was later deployed to Cuba and Mexico City where he established himself as a formidable military commander. Afterward, he was appointed Governor of Texas, serving from 1767 to 1770. His name was Hugh O’Conor and he was the direct descendant Turlough Mor O’Conor, first King of Ireland. He changed his name from Hugh to Hugo after his escape to Spain. 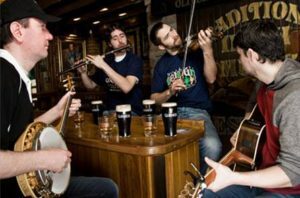 http://ltcornerpub.com/wp-content/uploads/2017/02/irish-in-texas.jpg 500 500 Bill Greer http://pvatestsite.com/LTPub/wp-content/uploads/2017/01/ltpub-logo-300x180.png Bill Greer2017-02-21 09:27:462017-02-21 09:27:46Texas Is An Irish State, Too! Old Bushmill’s Distillery. Founded in 1608. Whiskey is manufactured and drank all over the world, however, the very first whiskey distillery was launched in Ireland in 1608 and the Bushmills Distillery in Antrim still stands today. The people of Ireland were for the most part farmers and grew grain to make bread and then use the mash from the excess grain to create whiskey. Depending on your preference, you could make an argument that the people of Scotland “refined” whiskey production. You might notice the spelling of the word is different in Scotland (whisky) than the Irish spelling (whiskey). One of the primary differences is the number of times a Scotch Whisky is distilled (2 times) as opposed to that of Irish Whiskey (3 times). While this is not always true (some Scotch Whisky’s are distilled many more times than 3), it is a general rule of thumb and as such, allows Irish Whiskey to cultivate a lighter body and a “smoother” feel and finish. The most marked difference between the two spirits is the use of peat (partially decayed vegetation harvested from water saturated bogs – really, I am not kidding), which is burned to produce a smoke that dries the malt used to create Scotch Whisky. This produces a distinct aroma found in Scotch Whisky that is very appealing to its multitude of advocates. It also produces, although to a lesser degree, some of the unique flavor characteristics of Scotch. flavor of the barley – a noted quality of Irish Whiskey. And this difference in grain treatment leads us to the philosophical differences in the two spirits. The Irish believe great whiskey begins with the selection of correct distillates (grains) and careful attention to the distilling process often referred to as “vatting”, while the Scottish believe great whiskey is made primarily by the skill of the master blender. 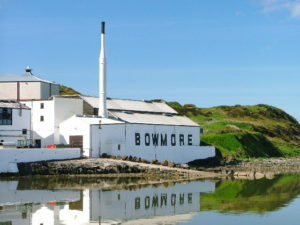 Bowmore Distillery, the oldest of all Scottish distilleries was founded in 1774. 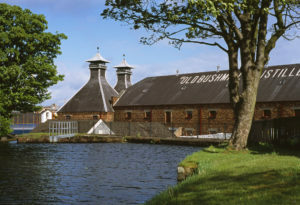 In Scotland, great whisky is produced by blending many different, finished whisky’s. This is why the term “blended” is so commonly used in conjunction with Scotch. But it is important to note that “single malt” whiskey is also blended unless it is “single cask”. A good single malt will usually be a blend of several different whisky’s, of different ages, although they will all be made from one single type of grain. Aging is also a major difference. Whiskey does not age in the bottle like wine, but in the cask. This process is what turns the color of whiskey from clear to golden brown. Naturally, the flavors of the wooden cask are also absorbed by the whiskey, with Scotch Whiskey aging for a minimum of two years and Irish Whiskey aging for a minimum of three years. What is most important is the age of the whiskey is a tool of the whiskey maker to produce a final vintage that is optimal. That is to say – a whiskey of 12 years is no better than one of 18 or even 30 years. It is merely the subjectivity of the maker that determined the best term for the whiskey at hand. Of course, the longer it is aged the more expensive it is. But it does not mean it is necessarily better. Only you can determine that. Always remember that your own palate is the ultimate truth teller. If you don’t like what it is in your glass, it is not great whiskey. No matter how long it has been aged. A Great Irish Wine from France? Everyone knows about the great wines of Bordeaux. If you have ever had one of the 1st growths in a marquis year, you know that it is very difficult to go back to a two-buck-chuck! Another bit of common knowledge is the French will do nearly anything to protect the reputation of those things that are decidedly French, their great wines are no exception to this rule. What is not common knowledge is that one of the greatest wines of Bordeaux, in fact many consider it to be the greatest value, carries an Irish name. Yes you read that correctly. One of the greatest French wineries was founded by an Irish immigrant bold enough to challenge the French stronghold of wines. That wine is Lynch Bages (prounounced with a soft j on the end, the s is silent) and the name of the man who had the bullocks to do it was Thomas Lynch. Lynch decended from the Tribes of Galway – 14 families who dominated the economic and political events in medievel Ireland until the Irish rebellion of 1641, long before Thomas Lynch was born. However, when he came of age and married, he inherited an old estate in Bages, France. After many years, he passed the property on to his son who passed it on to Thomas Lynch’s grandson, Michel. During these years, the property was producing excellent wine (much to the chagrin of the French). In 1824, the property was sold to Sebastian Jurine, a swiss wine merchant who held the winery for many years. In 1855, the wines of the Medoc region (the left bank of Bordeaux) wanted to classify the wines so wine drinkers would know what was in fact a “top shelf” and which were run-of-the-mill table wines. 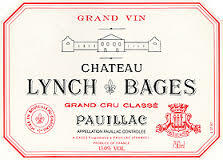 Lynch Bages was considered to be a Premier Cru at this time (even Thomas Jefferson considered it as such). But the members of the French wine cartel were not going to allow a winery founded by an Irish upstart to become part of the “1st growth” classification. So Lynch Bages was relegated to a second class and in fact is considered by many to be the best of all of the 2nd class wines. In fact, I have personally witnessed Lynch Bages wines outperforming 1st growth wines such as Lafitte Rothchildm, Margaux or Latour in blind tastings. It is that good. What’s great about Lynch Bages being classified as a 2nd growth wine is the price. You get the quality of a 1st growth wine for a fraction of the price (very similar to finding a bottle of Lafleur Petrus). And of course it’s also great that it is an “Irish” wine. At least we are going to claim it as such. 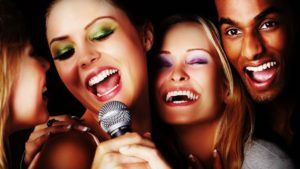 http://ltcornerpub.com/wp-content/uploads/2017/02/download-1.jpg 160 223 Bill Greer http://pvatestsite.com/LTPub/wp-content/uploads/2017/01/ltpub-logo-300x180.png Bill Greer2017-02-13 19:45:472017-02-13 19:49:15A Great Irish Wine from France?